SOC provides its comments about the FAA's draft Environmental Assessment for Paine Field. It is fatally flawed. Click here for comments submitted by SOC in October 2012. Click here for the comments submitted by SOC in February 2010. SOC provided its comments about the FAA's draft Environmental Assessment for Paine Field. It is fatally flawed. Here are comments submitted by others in the community. Click here for comments from the City of Mukilteo. Click here for comments submitted by Sea & Sound (environmental experts). 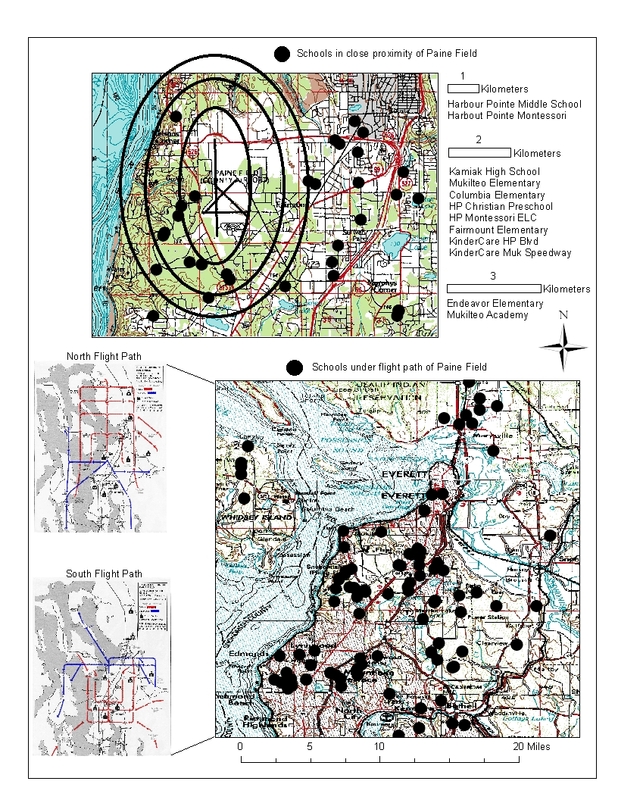 Click here to see a new map of schools exposed to the noise and flight paths. If you are angry about this--write to County Executive Aaron Reardon at County.executive@co.snohomish.wa.us and/or to the County Council. Tell them you hold them accountable. It is disingenuous and wrong to "assess" the impact of only a few flights per day when the FAA does not allow for flight restrictions if scheduled service starts up. Rise up and voice your opposition to this short-sighted scheme of shoving us down the slippery slope of scheduled air service at Paine Field. Based on Freedom of Information Act email correspondence, SOC found that the FAA Seattle Airports manager threatened to withhold up to $70 million of stimulus and other airport grant money unless the County successfully negotiated with the airlines to start up air service and to subsidize building a terminal at Paine Field. The FAA has overstepped their bounds and made this local issue a federal issue. What right does the FAA have to push commercial air service on our community when there are two international airports under capacity within a one-hour drive? The FAA cannot force us to change the role of Paine Field from general aviation to commercial air passenger service. However, if the operating certificate is changed, the growth of air service cannot be restricted. Theoretically, we may eventually have as many flights a day as San Diego International Airport, which is up to one takeoff every two minutes. Save Our Communities filed a Dept. of Transportation complaint with the waste, fraud, and abuse hotline that investigates the fraudulent statements by the FAA. We have received a response, and the DOT is directing an inquiry into our allegations of improper actions and fraudulent statements by employees of the FAA. We need your help. Our group, Save Our Communities, has previously submitted evidence to show that the FAA made fraudulent statements to the Snohomish County Council and to our local Congressional representative, Congressman Jay Inslee. These statements were simultaneously fraudulent and persuasive. Because of these statements, the Snohomish County Council took a highly debated vote in favor of funding a new passenger terminal at Paine Field (Snohomish County) Airport. This action will also, for the first time, change the role of the airport from a general aviation airport to one with scheduled air service. The FAA also improperly threatened to withhold discretionary funding, to withhold stimulus funding, and it acted pro-actively on behalf of airlines when its own policies call for the FAA to engage only on a reactive basis, after complaints have been lodged by airlines. No such complaints have been lodged. The FAA has made this a Federal issue! I have numerous concerns with this letter ….. we need to be careful not to enter into the political fray … we really don’t have much to go on in alluding to the idea that the County is not negotiating in good faith or is denying them access … These are private sector negotiations that we should not take a position on. In order to withhold discretionary funds we need to have found: (1) formal non-compliance under Part 16, (2) Land Use violations on the report to congress, (3) that the airport clearly remains in non-compliance despite FAA requests for corrective action or (4) the violation must be so egregious as to preclude additional Federal financial assistance until the issue is resolved. I don’t think we’ve reached these points yet at Paine Field. Especially, if we haven’t received any request for assistance from Horizon or Allegiant. The FAA’s heavy-handed tactics worked. In a 4-0 vote of the County Council on February 4, 2009 the Council voted to build a terminal.